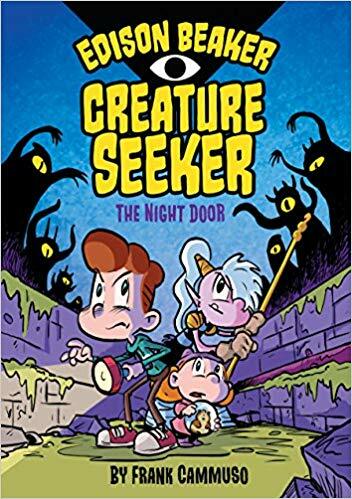 Edison Beaker, Creature Seeker: The Night Door by Frank Cammuso. Viking, 2018. 9780425291924. 160pp. While hanging out with their Uncle Earl, Edison, his sister Tess (short for Tesla), and her hamster Scuttlebutt learn the truth about the family business: they’re not exterminators, they keep their town safe from the supernatural creatures that live on the other side of the Night Door. Now their uncle is missing, and so is the keystone, the only thing that has the power to shut the Night Door. The hunt for the keystone takes Edison into the darkness on the other side of the door, where he has to save his family from Baron Umbra and his shadowy underlings. 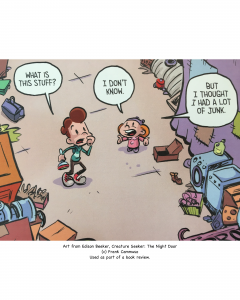 This beautifully drawn graphic novel is perfect for readers who enjoyed Cammuso’s other series: Salem Hyde, The Knights of the Lunch Table, and Max Hamm Fairy Tale Detective.